Credit: Photo courtesy Xinda Lin, Jiliang University. PULLMAN, Wash. — Scientists at Washington State University and China Jiliang University have discovered that the quality of the host rice plant determines whether the brown planthopper, a major pest on rice in Asia, grows short wings or long wings. Wing size determines whether the insect can fly long distances to other plants or stick around and feed off nearby rice plants, said Laura Lavine, professor in WSU's Department of Entomology. "It's all about the amount of glucose, or sugar, in the plant," Lavine said. "Rice plants with higher glucose levels are older and dying. That increase in glucose causes adolescent brown planthoppers to develop into the long-winged adults. The plant really is telling the insect how to grow." The findings, published in the Proceedings of the National Academy of Sciences, give scientists a potential tool in engineering ways to fight the pest. Over the life of a rice plant, the ratio of sugars to amino acids changes. 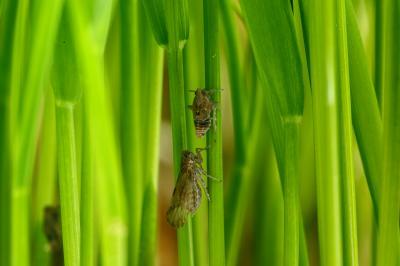 During the early growth stage, rice plants are a great food source for insects. These young rice plants have relatively low glucose levels and brown planthoppers don't need to search out a new home. They develop with short wings and, in females, large ovaries. The young plant is healthy and provides plenty of nutrition for the insects to survive and reproduce. But as the plants age, the glucose levels rise. This triggers a change in the young brown planthoppers. They develop with long wings and small ovaries, preparing to migrate away from the old, less nutritious rice plant in search of better food. "It's a one-time decision," said Lavine, who became the Entomology department chair July 1. "If the decision to stay and reproduce or migrate and fly away is incorrect, the brown planthopper is in trouble. Grow short wings when long wings are needed to move away and they die. Grow long wings when they could manage with short wings and they're leaving a healthy food source and have to needlessly search for another home." Once insects reach adulthood, they can't alter their body structure, she said. The hope is now that this discovery has been made, other scientists could manipulate the insect into making long wings and leaving. The brown planthopper, Nilaparvata lugens Stål, is one of the most destructive rice pests in the world and threatens the sustainability of rice production and global food security. "The results of this study will hopefully allow scientists a new way to figure out how to trick the brown planthopper into developing into the wrong form so that they die before they become pests," Lavine said. The most surprising part for the researchers was having just one factor, glucose, be the sole determining factor. "It has been difficult to isolate environmental signals that influence insect morphology and behavior," Lavine said. "But it's not for the brown planthopper. The plant's glucose level is the signal on whether they stay or go." One reviewer of their paper suggested they experiment with brown planthoppers in a lab, to see if adding glucose to a developing bug caused the change. "We injected glucose directly into brown planthoppers and it worked. They developed long wings just as if they had been feeding on the old plants," Lavine said. "We were so surprised it was that easy."